The natural elements of the stones and crystals are stunning on their own as a single strand, but this summer is about channeling your inner bohemian self and loving to layer. Have fun choosing and collecting complimentary pieces to layer together to create a truly unique look for every day. Choose a basic crystal charm necklace from Pools of Light and layer it with a beaded stone strand from Chan Luu. The trick is to choose two different lengths then add and take away layers of beads, charms or crystals to discover the combination that brings you your strongest energy. You need no more than your favorite white t shirt to showcase the mixing and matching of your personal collection and create a truly chic and effortless look. 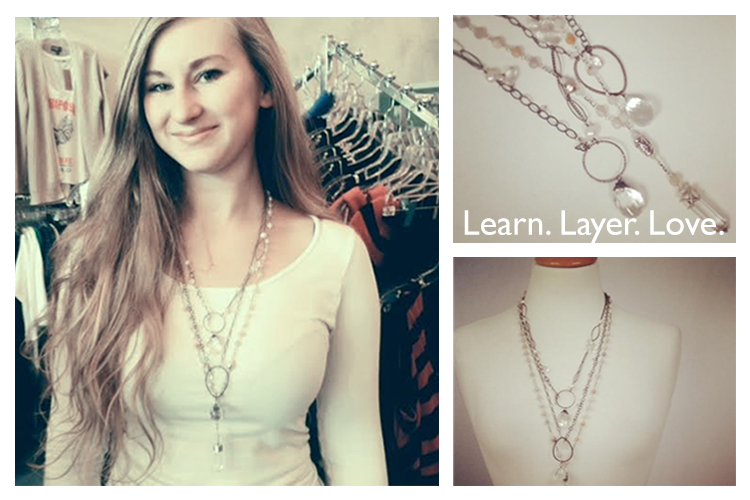 So go ahead, Learn.Layer.Love. PONS Avarcas Sandals are here, and we are voting them the number one must have footwear accessory this summer! Avarcas sandals, the traditional sandal of Menorca Spain, are designed with both comfort and style in mind. The minimal shape of the sandal has a quiet elegance and maintains lasting comfort making this sandal completely versatile and practical for your busy life. The versatile women's avarca sandal has become the must-have fashion accessory and the everyday-all occasion footwear. The casual design will get you through any daily adventure that life throws your way with effortless style and comfort. The PONS brand is a family owned business, specializing in artisan avarcas sandals since 1945. The line is huge in Spain and now finally making waves in the USA. The AvarcasUSA brand works exclusively with Pons to bring eco-friendly artisan made sandals to sustainable-minded Americans. The third generation shoe makers continue the family tradition, giving each detail the utmost attention. Handcrafted from quality leather and lightweight rubber soles according to traditional measures, Pons avarcas sandals are a classic shoe available in a variety of seasonal colors to fit your lifestyle. Try them here at Details today, watch for new styles and colors! 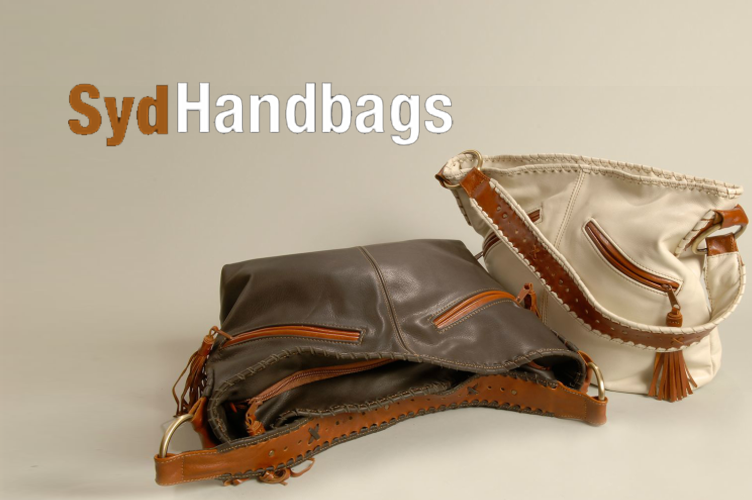 Details is excited to share the artisan work of Syd Handbags, a homegrown Wisconsin leather artist…Literally. We love shopping small and supporting local, and when we find a Wisconsin artisan product that is as smart and stunning as Syd Handbags, we are more than happy to shout it from the Details rooftop! Syd, a product of two artists, was born and raised in our beloved Wisconsin growing up in and around her parent’s leather shop and traveling the country for art shows. Surrounded by all types of artists she watched and learned while gaining respect for the life of the artist and for things made by hand. Syd now works with her own hands creating beyond beautiful leather bags and raising two young children around the same family studio. We are in complete awe of the uniqueness and fine craftsmanship of every single Syd handbag. The buttery leather is beyond soft, it has a fantastic drape which lends to endless shapes and styles that just get more beautiful with age and wear. Syd lovingly adds fine detailing to each piece with whip stitching, beading and contrast inlays. The versatile leather bags are available in dozens of colors and textures such as embossed cowhide, croc prints and suede. One of Syd Handbags most prominent features is an outer zipper pocket for convenient phone access. Syd offers one of a kind pieces that are start to finish handmade in her Wisconsin studio and each hold their own outstanding personality, how could we ever choose which to share? We couldn’t, so we chose them all! Syd Handbags Trunk Show happening now through February 25 at Details, 502 Water St. Swatches are available in store for customized orders. Preview a portion of the collection at detailsdirect.com today. Shop now for the greatest selection of Syds one of a kind creations! The little black dress is a wardrobe essential, and Details presents a great collection just in time for Valentine’s Day! A little black dress is a classic piece that is pertinent to every woman’s personal collection. Once you find that perfect fit that hugs your curves and loves you in just the right places, you will never want to let it go. And you won’t have to! A little black dress is a timeless look that will alleviate that stress of getting dressed by becoming a go to piece in your wardrobe. Pair with a blazer for a working lunch, throw on a colorful cardigan for that last minute spring fling or layer a strand of pearls with an essential black heel for date night! The opportunities are endless. The only challenge is finding the perfect match for you. And that’s where we’ve got you covered. The hunt is over! Details has a great selection of little black dresses including styles by Joseph Ribkoff, Bailey44, Sympli and now introducing Fig. Debut your dress this Valentine’s day and challenge yourself throughout the year to style up or down with season appropriate accessories. You will never have that ‘what do I wear’ moment again. …With a Little Retail Therapy. We always love taking sound advice from our favorite health and wellness specialist Dr. Andrew Weil, M.D. Especially when it comes to shopping! New Studies suggest that retail therapy has emotional benefits. Of course we all get excited over finding that perfect fitting jean, or that black heel you can dance in all night. But who knew that making a decision to purchase those pants or that shoe actually restores a sense of control and reduces sadness. A study at the University of Michigan compared browsers to buyers and concluded that the act of buying has higher and longer lasting positive effects on mood over the mere stimulation of browsing and window shopping. Winter blues is something we definitely can all relate to here in Wisconsin, especially on this brisk 20 below day. I think that buying some brighter, lighter clothes will definitely boost my mood this weekend and I’ve had Michael Stars and Current Elliot Boyfriend Jeans on my mind. Beat Cabin fever and visit us down here on Water Street! New Spring 2014 is rolling in and the fresh color palette is sure to gear your mind towards sunnier days. If you aren’t quite optimistic enough to begin preparing for warmer weather, check out our 75% off sale. We won’t blame you for hibernating from the snowy streets but check out what’s new on detailsdirect.com from the comfort of your cozy home! For more on the article and other great advice from Dr. Weil, check out his site,http://www.drweil.com/drw/u/WBL02389/Benefits-of-Retail-Therapy.html. The New Year is here and everyone is ready for a wardrobe refresh. It’s that tricky transitional time when the weather is still reminiscent of winter but we are preparing for spring. So how do you get the most bang for your buck? How do you liven up your pre-holiday pieces while still thinking forward? Layering is your answer. 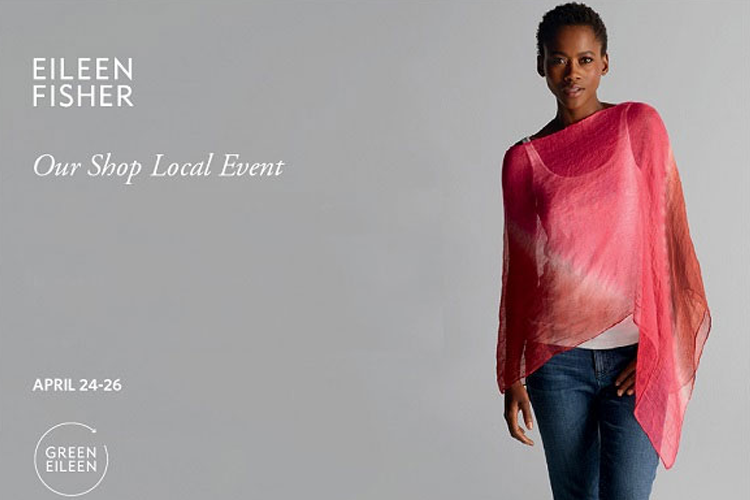 We love Planet Clothing for layering and their new spring 2014 collection has arrived at Details! A lightweight sweater is the perfect transitional piece for spring such as the Planet Boatneck Stripe or Mixed Rib. Layer now over long sleeves or turtle necks and as the season progresses to spring switch out your base layer to tees and tanks. Planet Basic Boxy Tees and Planet EZ V Tee are fantastic long sleeves that can be worn year round. Refresh your wardrobe with one of the new 16 spring colors available on our Planet Clothing Page or check out our favorite new colors in the store, a soft Wedgewood blue and Pistachio. Layer planet long sleeves now with sweaters and turtle necks and in the spring don them solo with leggings and flats. One of our favorite pieces we brought back this season is the Planet Tank Dress; the long fabulous drape makes a beautiful fit on every shape and the style has pockets, a detail we always love. A great dress to wear into the summer, but try it now with a cardigan or jacket! The Tank Dress is available in a beautiful ombre dip dye, a popular trend of the season. Basic EZ Tee and Crop Sweater also available in the graphite ombre dip dye, you definitely will want to check them out before they are gone! Planet Clothing women’s apparel line was designed for layering, truly giving opportunity for individual styling and personal expression. The soft silhouettes and relaxed fits offer practicality and comfort while maintaining modern elegance. We love the natural fabrics which have a soft luxurious hand such as the Peruvian Pima Cotton, some of the finest cotton in the world. The wrinkle free fabrics are great for travel, the lightweight linen sweaters are perfect now for traveling south. Shop now on our Planet Clothing Pagel or visit us in the store! 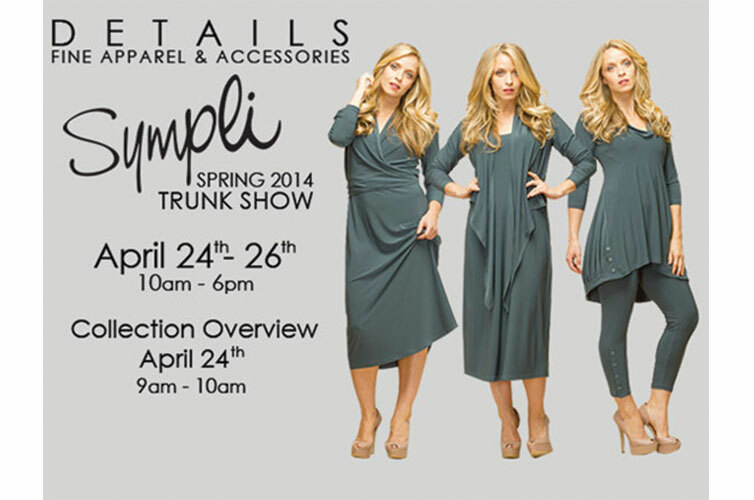 Be sure to watch for new styles as we continue to bring in new Spring 2014!